Keratoconus is a non-infectious eye condition in which an individual’s normally round cornea progressively thins and becomes cone-shaped. This irregularity causes images to be distorted when projected onto the retina, resulting in significant visual impairment. Keratoconus generally affects both eyes, though one eye will typically advance more quickly than the other. The incidence of Keratoconus has been reported to affect 1 out of every 2,000 people and is often diagnosed in patients in their late teens. Males, females, and all ethnicities are affected equally. In the early stages of Keratoconus, glasses or soft contact lenses may be used to correct any vision issues. As the cornea progressively thins and bulges into a more cone-like shape, rigid gas permeable (RGP) lenses are often needed to provide a clear surface in front of the cornea, allowing the light rays to be projected clearly to the retina. For many years, this was the main treatment option for keratoconus patients until they eventually required a corneal transplant. There are now new treatment options available, including Corneal Collagen Cross-linking and Intacs®. Corneal cross-linking (commonly referred to as “CXL”) is a minimally invasive, in-office procedure that is used to halt or slow the progression of keratoconus. Using a combination of riboflavin drops and ultraviolet light, the bonds between collagen molecules in the cornea are strengthened, or “cross-linked.” Given the safety of the procedure and the overwhelming body of evidence validating its effectiveness, CXL has become the preferred procedure worldwide to stop keratoconus progression in the early phase of the disease. 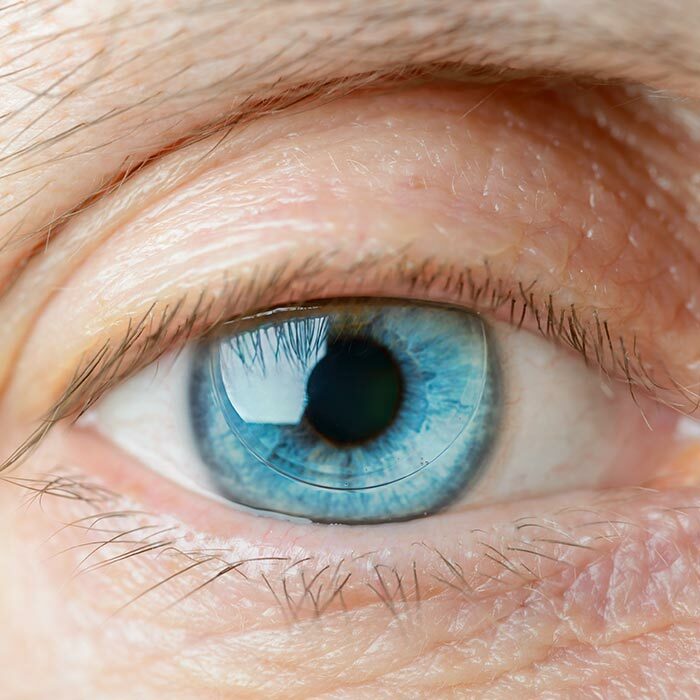 Our Houston surgeons Dr. Sanders and Dr. Salem, will examine your eyes and determine if you are a good candidate for CXL. Intacs® are clear, thin inserts called intrastromal corneal ring segments (ICRS) that are placed in the outer edge of the cornea. 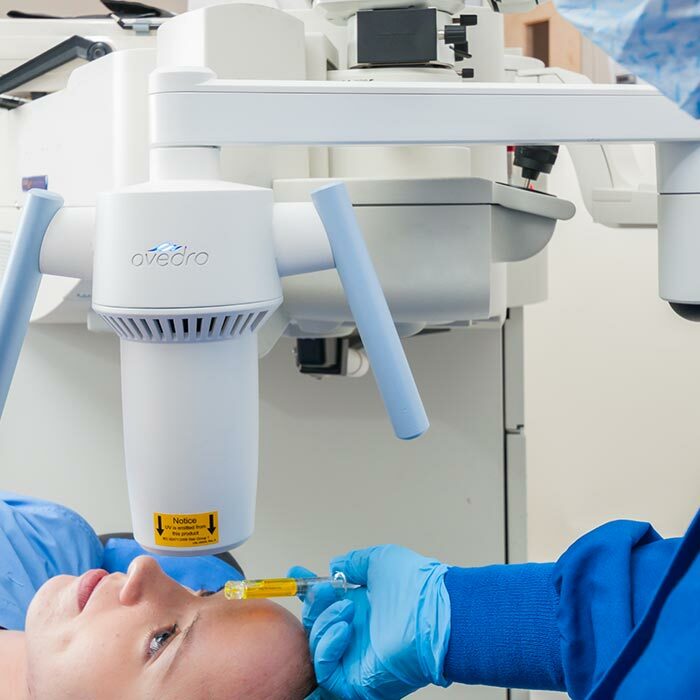 They are inserted into a small channel that is created by a femtosecond laser, the most precise method available.Intacs® reshape and normalize the cornea without removing any corneal tissue, allowing for a better contact lens fit. According to FDA guidelines, Intacs® corneal implants for the treatment of Keratoconus are intended for the reduction or elimination of myopia and astigmatism in patients with Keratoconus who are no longer able to achieve adequate vision with their contact lenses or glasses so that their functional vision may be restored and the need for a corneal transplant procedure can potentially be deferred. Rigid gas permeable (RGP) contact lenses are unlike soft lenses in that they are rigid lenses made of durable plastic that transmits oxygen. The use of gas permeable contact lenses has remained at the core of the optical management of keratoconus. These lenses, manufactured in a large variety of unique designs, provide a regular surface over the cornea to neutralize the visual distortions caused by an irregular cornea. Fitting RGP lenses for patients with keratoconus may take time, as no one design is best for every type of keratoconus. 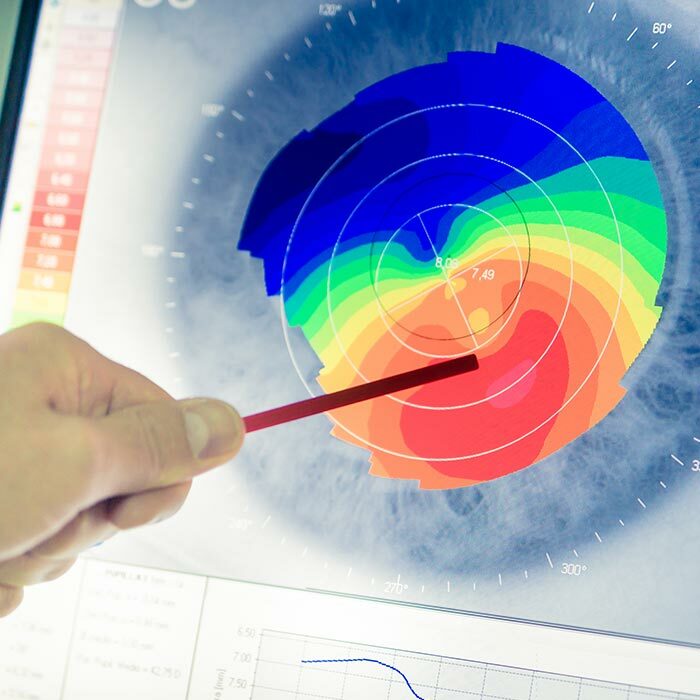 Each lens design has unique characteristics, and the practitioner needs to carefully evaluate the needs of the individual and find the lens that offers the best combination of clear vision, comfort, and corneal health. Rigid gas permeable contact lenses offer some outstanding benefits for patients diagnosed with keratoconus. Because RGP lenses are made from a firm plastic, they retain their shape when you blink, which can provide sharper vision than pliable soft lenses. Rigid gas permeable lenses additionally allow oxygen to reach your eye, which promotes eye health and wearable comfort. RGP lenses do not contain water as soft lenses do, and therefore proteins and lipids from the eye do not adhere to the lenses as readily.